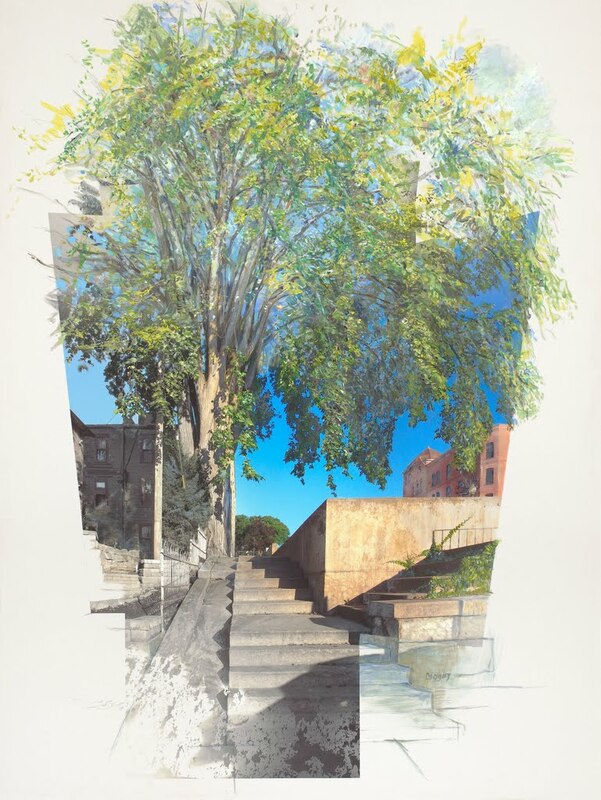 The location that inspired this work is in Saratoga Springs, on Maple Avenue, just north of Lake Avenue – toward the City Center where there is a stairway up toward Broadway. This angle appealed to me because the dynamic elements fit two interests with which I am currently engaged — on a general level, the visual expression of the interaction of natural and geometric spaces; and on a specific level, paying attention to the role of trees in the cityscapes of Saratoga Springs. 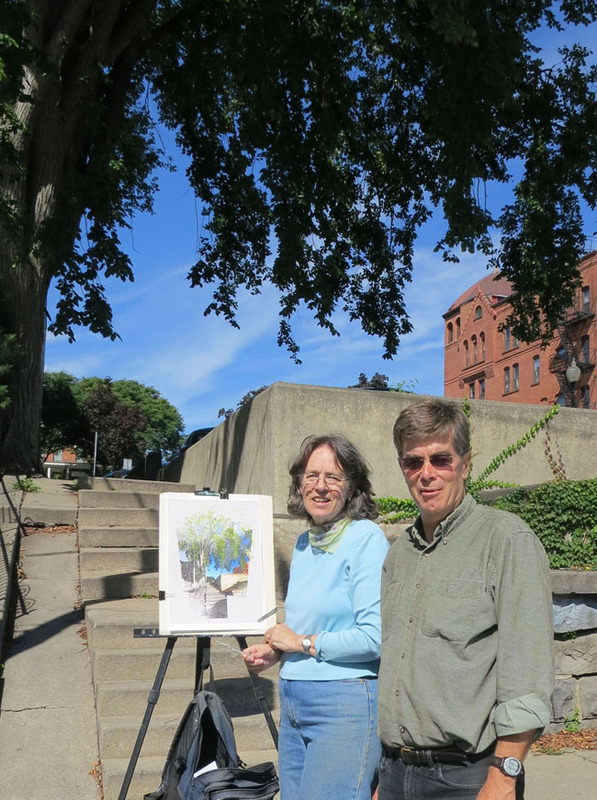 In 2013 the work of the Saratoga Springs Urban Forestry Project inspired me to paint some of the legacy elms that had survived the Dutch elm disease. I spent time sketching and photographing this grand elm under various light conditions and from various angles. In order to make a strong statement about the way in which the limbs and foliage escape the also intriguing geometry of the city steps, I decided to start with a base layer of photography and then use just paint for most of the details of the exuberant leaves. After reworking the Photoshop file for the larger size, I started the version in this exhibition in mid January 2014, working from the smaller study, from photos, from memory and just working to make an interesting image. It took the return of spring to really finish it, with several mornings set up on the sidewalk or just by the curb. Spent time from 8-9 am at the site. Wanted to look at the color of the light on the upper leaves that hang out overhead and the interior upper leaves that give the context of that bursting forth. Back in the studio in the afternoon, more adjustments to bring out that upper section. Subdued the other greens, removed blue from sky behind limbs. That helped in several ways- making more depth beneath the leaf clumps, adding a jazziness and attention. Then began opening up some other areas in arching circles- one going up in air in the upper left corner. That seems to help with the sense that the tree goes on much further. 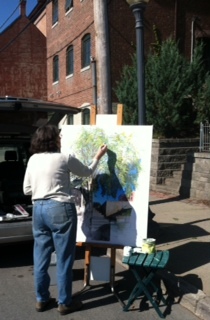 A big struggle of decision making with the extent of the painting at both sides of the tree. At this point I like the openings of the left side. The right seems an afterthought. Each part must feed the rest. It helped last night to make smaller marks within the lower “escape”. I keep adjusting the greens. Sections of contrast, sections of confusion. The angles of the strokes help build the space without being specific to the “real” details. Happy with the heaviness of the lower branches.